“Flowers Aren’t Enough,” an event to educate women and teenaged girls about abusive relationships. Sponsored by the National Council of Jewish Women (Greater Detroit Section) and Temple Israel Sisterhood, and supported by WISDOM. The program will begin at 7:00 PM at Temple Israel, 5725 Walnut Lake Road, West Bloomfield. For more information contact NCJW at 248-355-3300. See Flyer Below!! Jewish Book Fair: Ma Baseema: Middle Eastern Cooking with Chaldean Flair. Discussion of the book with a cooking demonstration and tasting. WISDOM is a sponsor. 11:30 AM at the West Bloomfield Jewish Community Center. “Rembrandt and the Face of Jesus” – an interfaith panel program, sponsored by the Interfaith Leadership Council, will be held in conjunction with the Rembrandt exhibit from 3:00 pm – 6:30 PM at the Detroit Institute of Art. There will be a charge for this event. Contact Gail Katz at gailkatz@comcast.net See article below!! Major community leaders and organizations marked the tenth anniversary of 9/11 through A-OK (Acts of Kindness) Detroit, a day of community service and intercultural connection on Sunday, September 11th. Volunteers met at the Focus: HOPE campus in Detroit to perform service activities for its food outreach, education and community revitalization efforts. They joined volunteers from ACCESS, Women’s Interfaith Solutions for Dialogue and Outreach in Metro Detroit (WISDOM), the Interfaith Leadership Council of Metropolitan Detroit, the Council of Islamic Organizations of Michigan, City Year Detroit, United Way, J-Serve, the Jewish Community Relations Council, and the University of Michigan-Dearborn. The aim of A-OK Detroit was to transform 9/11 from a day of mourning into a day of caring and service by bringing together diverse community groups with common missions of unity, peace, and mutual understanding. The Acts of Kindness (A-OK) mission was to change 9/11 into a day for people to work side by side to find our commonality as human beings, to reduce myths and stereotypes about the “other” and increase respect and understanding. Starting at 1:00 PM about 830 volunteers came together in the parking lot of Focus: HOPE for a kick-off rally. William Jones, CEO of Focus: HOPE, Annie Ellington, Chief Service Officer at the City of Detroit Office of Mayor Bing, Hassan Jabeer, CEO of ACCESS, and Asim Mishra, Deputy Chief of Staff for Policy at the Corporation for National and Community Service in Washington D.C., were some of the dignitaries who spoke at the rally. City Year Detroit and AmeriCorps volunteers ended the rally with exercises to energize the crowd, and then everyone was deployed to their community service project sites. The adults served in many places – working in lots near Focus: HOPE to pick up trash and cut down weeds and in the food warehouse, packing food for the hungry in Detroit. The adults were split up through a color-coded system that assured each team consisted of people of all faiths, races, ethnicities and ages. Chinese transfer students from the University of Michigan’s Dearborn campus worked alongside Arab Americans. Christians and Jews worked side by side Muslims and Buddhists in a spirit of respect and harmony. The teens then came indoors and worked in the conference room upstairs at Focus: HOPE writing letters to our troops, stuffing backpacks for Detroit Public School students, putting supplies (donated by Arts and Scraps on Harper Ave. in Detroit) into kits for Detroit Public School teachers to use with their students, and creating “inventions” from Arts and Scraps supplies and writing about what these inventions do, so that DPS teachers can use them as models for their student assignments. Jewish teens from J-Serve (Jewish Teens Serving the World) worked together with Muslim teens from ACCESS (Arab Community Center for Economic and Social Services) and Christian teens from various churches in the Metro Detroit area. Every teen who registered was given a different colored wristband that identified the organization that he/she was volunteering with. In this way we directed the teens to find a partner who had a different colored wristband and sit at a table that represented the diversity of A-OK Detroit! Following the service projects the teens engaged in structured dialogue with each other. They each shared information about why they came to A-OK Detroit; what opportunities there were in their high schools for crossing boundaries to make friends of other faiths, cultures, or races; what traditions there were in their faiths or cultures about naming a child (and how that may have impacted the name they were given! ), and what misunderstandings or stereotypes they had personally experienced or witnessed. Some of our teens and young adult volunteers had a chance to share why A-OK Detroit was so important to them. Allye Gaietto, a City Year Detroit Volunteer, came from Muskegon, Michigan and was dedicating 10 months to service in Detroit. Four days a week she works with sixth through tenth graders in Detroit, concentrating on ready and math skills. Every Friday Allye works at a senior center in Detroit helping with beautification of the facility and the grounds. Allye said that City Year Detroit had given her an incredible opportunity to work on her leadership skills!! Helping out at A-OK Detroit was part of her service mission. Adults came back from their community service projects at about 4:00 PM and also had a chance to dialogue with each other as they broke bread (pizza) together. As the Co-Founder of WISDOM and the Co-Chair of the Education Committee of the InterFaith Leadership Council, I am so thrilled that my life’s passion – bringing diverse folks together for community connection and dialogue – was realized at A-OK Detroit!! I look forward to A-OK Detroit becoming an annual signature interfaith/intercultural event in Metro Detroit!! Here’s the link to a short video about A-OK Detroit!! Below are some links to articles – some with video! Check them out. 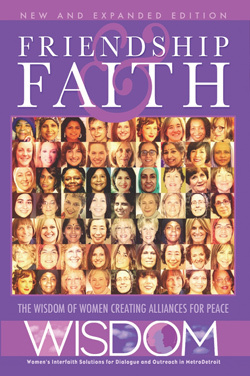 1) Women Transcending Boundaries – a sister women’s interfaith group to WISDOM, are featured on PBS for their efforts in the 10 years since 9/11. A neighbor can be a Muslim “and still be my friend,” said Pastor Bob Roberts Jr. of NorthWood Church. Roberts was surprised by the number of friends who showed up Sunday for the church’s Building Bridges with Fellow Texans event. “We had a goal of 1,000 Christians and 1,000 Muslims,” he said. “We ended up with 1,500 Muslims and 1,000 Christians.” Folks were standing against the walls of the 2,000-seat sanctuary, and monitors were set up in the foyer, where at least 400 others stood, said Paul Schneider, a NorthWood spokesman. Roberts said NorthWood had considered having the event on the previous Sunday, Sept. 11, but the Muslims helping organize the gathering asked to put it off for a week. “The more we thought about it the more sense it made,” Roberts said. The 10th anniversary of 9-11 inspired NorthWood members to invite Muslims — and Christians from other churches — to their sanctuary. But making the Muslims feel uncomfortable would have defeated the purpose, Roberts said. 3) Phyllis Rodriguez lost her son Greg in the attack on the World Trade Center. In the years since that terrible loss, she has formed what many consider to be an unusual friendship with Aicha el-Wafi, the mother of Zacarias Moussaoui, who was convicted of playing a large role in the attacks. He is currently serving a life sentence for his crimes. See video link below. Hindu American Foundation’s Swaminathan Venkataraman discusses a new report on the history and practice of caste-based discrimination – and why it has no viable place in the Hindu tradition. On September 6, 2011, Claremont School of Theology, a distinguished United Methodist seminary with roots back to 1885, joined in partnership with The Academy for Jewish Religion, California, and the Islamic Center of Southern California/Bayan College. Together, they and a number of other affiliates have joined to create Claremont Lincoln University (CLU), an institution like none other. Training imams, pastors, and rabbis will be a core goal at CLU. Seminarians will have separate curricula and degree programs for clergy formation, part of a larger set of offerings and degree options focused on the interdisciplinary, intercultural, and multireligious needs of the world in the 21st century. Opening conversations with people of other faiths is becoming increasingly urgent in a world where people act out their religious prejudices by killing innocents and engaging in other terrorist acts of wanton human destruction. The recent tragedy in Norway reveals the horrors that can be done in the name of faith. Such episodes cause all of us to shudder, wondering how our distorted and sometimes twisted confessions of faith can contribute to such malicious, even psychotic behavior. The church cannot afford to brush aside these episodes, shaking our heads in disbelief. We, the Christian church, this community of devout believers who believe Jesus is the way, must enter this treacherous territory of confronting the evil that is being sown abroad in the name of God. If we fail to speak, we become complicit in contributing to the abuse of religion and failing to take responsibility for the evils being perpetuated in the name of the faith we affirm. At the outset, we should set aside the notion that our own faithfulness can be demonstrated by rejecting the legitimacy or integrity of other faiths. The plurality of faiths will not disappear if we simply ignore them. It is foolish to think that God has taken up residence only in our own religion and acts with anger or judgment toward all others. Such a myopic view represents a religion that has been overtaken by narcissism. God is the God of all people. God’s light shines upon all people. As Christians, our confessions should not be used to assert any limitation on the will or the voice or the intervention of God in human affairs. Insecurity in our own beliefs is the chief culprit that causes us to feel that we need to overturn the validity of another’s faith in order to be sure of our own. While we can only speak from where we stand, we should leave every other believer free to do the same. We are neither wise enough nor good enough to judge the faith of another. Christian belief, then, is not about claiming absolute certainty or giving unencumbered allegiance to the doctrines of our faith. Belief is not a set of facts to affirm, but a commitment to make. When we say “Jesus Christ is Lord,” we are not stating a fact; we are making a commitment to follow Jesus. As followers of Jesus, our commitment to Jesus as the Christ becomes the defining center of our lives. The integrity of that commitment, however, is in no way dependent upon the invalidity or the lack of integrity of someone else’s religious commitment. Our aim should not be to wage war among competing commitments. Both reason and good faith point us in a different direction. Grace will be more powerful than war. Thoughtful conversation will be more productive than religious bullying. If we are to cultivate serious interfaith conversations, we should realize that understanding begins with listening, not talking. If as congregations of faith we are confident and committed in our own belief, how do we begin to reach out to neighbors who embrace other faiths? If we are able to convert our anxiety and distrust into friendship and understanding, we will have taken a giant step toward peace and building a framework for hope in the world. Jesus embraced and affirmed the worth of people whether they followed him or not. Passing baskets of “loaves and fishes” was not preceded by an altar call. We should feed one another and ask questions later. When Betsy Wiggins opened her front door and saw the woman in a full black face veil coming up her flower-lined walkway, she wondered if she had done the right thing. It was 11 days after 9/11, and Mrs. Wiggins, a speech pathologist and the wife of a Methodist minister in Syracuse, had called the local mosque and invited a Muslim woman she did not know over for coffee. She and the Muslim woman, Danya Wellmon, a medical lab technician, sat in the Wigginses’ breakfast nook for hours and talked about their faith, their careers, their children – and their mutual despair over the terrorist attacks. They bonded that day, and decided that they should start a broader discussion. As a next step, Ms. Wellmon invited nine Muslim women, and Ms. Wiggins invited nine others (Christians, Jews, one Buddhist and an Ismaili Muslim) to join them for a potluck dinner by the big stone fireplace in the living room. In Syracuse, as in countless other communities, 9/11 set off a phenomenon that may seem counterintuitive in an era of increasingly vocal Islamophobia. A terrorist attack that provoked widespread distrust and hostility toward Muslims also brought Muslims in from the margins of American religious life – into living rooms, churches, synagogues and offices where they had never set foot before. American Christians and Jews reached out to better understand Islam and – they will admit – to find out firsthand whether the Muslims in their midst were friends or foes. Muslims also reached out, newly conscious of their insularity, aware of the suspicions of their neighbors, determined that the ambassadors of Islam should not be the terrorists. “Before 9/11 we were somewhat timid,” said Saad Sahraoui, president of the Islamic Society of Central New York, the largest mosque in Syracuse, when the attacks occurred in 2001. “We just kept to ourselves, just concerned with our families and our children. In the months and years after 9/11, in communities large and small, mosques opened their doors for Friday prayers and iftar dinners to break the Ramadan fast. Churches and synagogues deluged imams with speaking requests. Muslim, Jewish and Christian performers hit the clubs on comedy tours. In Syracuse, like most other places, the road to interfaith understanding was full of bumps. When Ms. Wellmon tried finding nine Muslim women to join her, she said she had to “browbeat” some of them into it. As a white convert, Ms. Wellmon did not find it a stretch to have coffee with Mrs. Wiggins. But the other women in the mosque were immigrants from the Middle East, Asia and Africa, and were not accustomed to speaking with outsiders about their religion. They began by talking about the Koran and Islamic rituals, but they soon found themselves in intimate discussions about how they pray, what they believe about birth and death, why they do or don’t wear head scarves. It was hard for the group’s feminists to reconcile their assumptions about Islamic oppression of women with the room full of dynamic, assertive, educated Muslim women. The group outgrew Mrs. Wiggins’s living room and took on the name Women Transcending Boundaries. Soon, the group was organizing international dinners to raise money for girls’ schools in Pakistan. Members volunteered to teach English and sewing skills at a center for immigrants and refugees. They organized a community walk that they called Journey to the Tent of Abraham, with stops along the way at churches, a synagogue and a mosque. They turned a vacant lot into a garden where immigrants from Myanmar, Vietnam and Burundi grow vegetables. When Ms. Wellmon’s 21-year-old daughter, Sara, drove off a decrepit bridge and drowned in the icy Erie Canal in February 2003, women of many faiths filled the funeral at the mosque. But their relationships were soon tested when state and federal agents descended on Muslim homes and businesses in the Syracuse area and questioned 150 people. The raid resulted in the indictments of Dr. Rafil A. Dhafir, a Muslim oncologist who employed Ms. Wellmon, and three others on charges of sending funds to Iraq in violation of the embargo. At the trial, women from the interfaith group joined the doctor’s supporters in the courtroom. When he was convicted, on charges of Medicare fraud and misappropriating funds from a charity he ran, the community was divided. Some Muslim members of Women Transcending Boundaries say they felt betrayed when the group decided not to co-sponsor Muslim Solidarity Day a few years later on the anniversary of the raid. The women who objected to sponsoring the event said it had become too political and even anti-F.B.I., and by then the group had decided to avoid taking political stands. “I was optimistic after 9/11 that we can educate people, but now I feel we are giving our rights away in the name of security,” said Magda Bayoumi, a Muslim founder of the women’s group who has shifted her energies to other endeavors. This weekend, on the anniversary of the attacks, Women Transcending Boundaries is conducting the second annual A-OK! Weekend, a mobilization of volunteers in hundreds of projects all over the city. Women’s interfaith groups have also organized A-OK! weekends in Detroit and Orange County, Calif. The undertaking required hours of meetings, thousands of e-mails and plenty of arguing. In the middle of an interminable debate over the logo design, Joy Pople, the Syracuse group’s vice president, had an epiphany. The Song and Spirit Institute for Peace and its partners in faith throughout metro Detroit are proud to announce a Spirit of Assisi celebration, Thursday-Saturday, October 27-29, 2011. Commemorating the 25th anniversary of Pope John Paul II’s historic 1986 gathering of leaders of all faiths in Assisi, Italy to pray together for peace, we join in cooperation with the Archdiocese of Detroit, and with the support of area churches, synagogues, mosques, temples and other interfaith organizations, in a peace-filled dialogue – a cultural and spiritual exchange – with our brothers and sisters from a variety of faith communities. Thursday, October 27, at 1:30 p.m. the Archdiocese of Detroit will host Pilgrims for Peace at St. Fabian Catholic Church, 32200 W. 12 Mile Rd, Farmington Hills, MI. Religious leaders from Catholic, Jewish, Muslim, Orthodox (Christian), Protestant, Hindu, Buddhist, Sikh and other communities will be on hand to present documents and statements on world peace. This will also include a Peace presentation from area schoolchildren and music performance from Song and Spirit, featuring Jewish and Franciscan story-telling/song-writing duo, Maggid Steve Klaper and Bro. Al Mascia, OFM. Friday October 28, at 7:30 p.m., we welcome the entire interfaith community to Reform/Renewal-style Jewish Sabbath services at Congregation Shir Tikvah, 3900 Northfield Parkway, Troy, MI. Rabbi Arnie Sleutelberg and Maggid Steve Klaper will be joined by New York-based Cantor Ellen Dreskin, a nationally known Jewish teacher, program leader and musician. Refreshments to follow. Jewish, Muslim and Franciscan teachers at the Song and Spirit Institute for Peace, 2599 Harvard, Berkley, MI. Saturday evening at 7:00 p.m., we will present a musical program at St. Hugo of the Hills, 2215 Opdyke Road, Bloomfield Hills, with a community interfaith choir, followed by a Song and Spirit concert, featuring Maggid Steve Klaper and Bro. Al Mascia, OFM. All events are free of charge and open to the public. More details regarding Pilgrims for Peace participants and teachers and session leaders for Saturday morning and afternoon will be announced. It is our hope that these exciting, insightful and uplifting activities will build bridges of faith and understanding within our diverse communities. On its 25 anniversary, we embrace The Spirit of Assisi as an example to be embodied — a guiding force to heal a broken world, to complete that which cries for completion, to bring Shalom/Salaam to the world. wrote an article in the Detroit Free Press. While 9/11 is past and we deal with other aftermaths – tsunamis, hurricanes or genocides like in Darfur – the need to continue to build community, in our country and the world over, is something ever present. Globalization, economic hardship and belief in rleigious or national superiority need to be overcome through friendship, understanding and living the Golden Rule. Pluralism has become a verb for me, as I advocate for the religious freedome embedded in our Constitution and the Hindu principle that all of creation is one family. Critics question credibility of Manhattan College’s pick, and a change in center’s focus as supporters come to her defense. Manhattan College is revamping its Holocaust Center to include the further study of other genocides, as well as interfaith activities that would include Islam alongside Judaism and Christianity – the two religions that until now have been mostly alone at the core of Holocaust interfaith issues. Perhaps nothing accentuates the change more than the appointment of Mehnaz Afridi, 40, to be director of what will be renamed the Holocaust, Genocide and Interfaith Education Center. Afridi, a Pakistan-born Muslim woman, has been teaching at Antioch University, and her writings have primarily focused on Muslim identity and the intersection of Islam and the Holocaust. Women, War & Peace Coming to PBS in November!! Women, War, & Peace is a bold new five-part PBS television series challenging the conventional wisdom that war and peace are men’s domain. The vast majority of today’s conflicts are not fought by nation states and their armies, but rather by informal entities: gangs and warlords using small arms and improvised weapons. The series reveals how the post-Cold War proliferation of small arms has changed the landscape of war, with women becoming primary targets and suffering unprecedented casualties. Yet they are simultaneously emerging as necessary partners in brokering lasting peace and as leaders in forging new international laws governing conflict. With depth and complexity, Women, War & Peace spotlights the stories of women in conflict zones from Bosnia to Afghanistan and Colombia to Liberia, placing women at the center of an urgent dialogue about conflict and security, and reframing our understanding of modern warfare. Featuring narrators Matt Damon, Tilda Swinton, Geena Davis and Alfre Woodard, Women, War & Peace is the most comprehensive global media initiative ever mounted on the roles of women in war and peace. The series will present its groundbreaking message across the globe by utilizing all forms of media, including U.S. and international primetime television, radio, print, web, and worldwide community screenings, and will be accompanied by an educational and outreach initiative designed to advance international accountability in regard to women and security. Women, War & Peace is a co-production of THIRTEEN and Fork Films. Women, War & Peace will premiere in Detroit on our local PBS station Tuesday nights at 11:00 PM for an hour between Oct. 11 and Nov. 8, 2011. WISDOM along the with Diversity Task Force will be showing “Pray the Devil Back to Hell” on January 11th at the Birmingham Community House at 6:30 PM!! I Came to Testify ( October 11th) is the moving story of how a group of 16 women who had been imprisoned and raped by Serb-led forces in the Bosnian town of Foca broke history’s great silence – and stepped forward to take the witness stand in an international court of law. Their remarkable courage resulted in a triumphant verdict that led to new international laws about sexual violence in war. Pray the Devil Back to Hell (October 18) is the astonishing story of the Liberian women who took on the warlords and regime of dictator Charles Taylor in the midst of a brutal civil war, and won a once unimaginable peace for their shattered country in 2003. When the U.S. troop surge was announced in late 2009, women in Afghanistan knew that the ground was being laid for peace talks with the Taliban. Peace Unveiled ( October 25th) follows three women in Afghanistan who are risking their lives to make sure that women’s rights don’t get traded away in the deal. The War We Are Living ( November 1st) travels to Cauca, a mountainous region in Colombia’s Pacific southwest, where two extraordinary Afro-Colombian women are braving a violent struggle over their gold-rich lands. They are standing up for a generation of Colombians who have been terrorized and forcibly displaced as a deliberate strategy of war. War Redefined, November 8th) the capstone of Women, War & Peace, challenges the conventional wisdom that war and peace are men’s domain through incisive interviews with leading thinkers, Secretaries of State and seasoned survivors of war and peace-making. Interviewees include Secretary of State Hillary Clinton; Liberian peace activist Leymah Gbowee; Bosnian war crimes investigator Fadila Memisevic; and globalization expert Moisés Naím.